CDMA Trainer (CDMAL) provides a basic understanding of the concepts behind CDMA, and various issues that need to be considered in the design of a DSSS system. These include the Usage of pseudorandom (PN) codes and digital modulations BPSK. 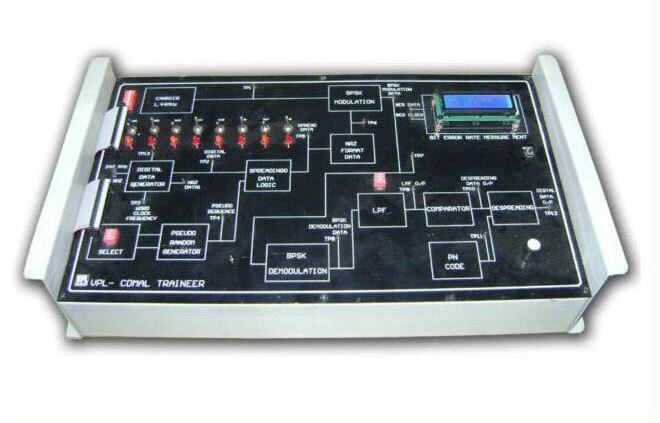 CDMA Trainer (CDMAL) has digital modulation & demodulation along with direct sequence spread spectrum (DSSS) generation and decoding, data signals, zero random bit signal generation. On Board Digital Data generator - 1 Nos. Word Length - 8 Bits. Modulation Carrier Frequency of 1.44 MHz. Low pass filter cutoff frequency : 240 KHz. Power supply requirement : 230V AC, 50 Hz.